Davao City is known to be the largest city the Philippines in terms of land area. It is not surprising then that there are lots of interesting places that you can visit to relax, unwind, and be in tune with nature. 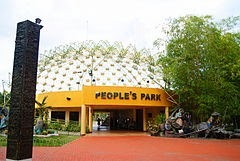 One place that you should not miss while in Davao City, Philippines is “The Peoples Park.” The place was once home to a sports stadium but for one reason or another it was turned into an eco park by the local government. The residents of Davao City and nearby provinces are just too happy with this development. You will never get bored once inside the park. Here are the top 7 activities that you should not miss. Davao City has lots of local laws that promote protection of the environment such as an anti-smoking bill and plastic bans in malls and shops. It comes as no surprise when you find these electric charged automobiles inside the park to help senior citizens and differently-abled people to roam around the park. Although priorities are given to them, other people are accommodated as well. You only have to find the schedule of the free trips for differently-abled people. 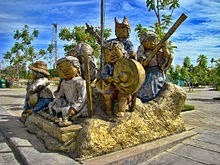 Davao City is once home to local tribes such as the Bagobos and the Manobos. These people were honored in the park with a statue resembling their kind. Be prepared to be amused though as the facial appearance of the supposed tribal people resembles science fiction movies characters. Be prepared to get wet if you want to. There is a dancing fountain inside the park and it sways and moves to the rhythm of the music. Rediscover the child in you. You might want to do more than gazing or staring at the water sprouting from the cemented pavement and take off your footwear instead to soak in the water dancing and jumping to the rhythm of the music too. 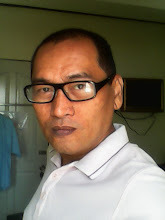 Davao City has a good weather; therefore, many plants can be grown and cultivated. Visit the garden inside the park and learn that more than thousands of plant species are grown inside the park. Truly, it is very relaxing to see flowers in different colors and sizes. You can ask from the attendant where and how to buy these flowers. It feels like you are in Central Park in New York when you see hundreds of pigeons waiting to be feed. Get tired of munching your biscuits? Don’t throw it in the trash bin, feed it to the pigeons instead and it will give you a wonderful feeling knowing that these birds eat your biscuits while sneaking a stare at you. During weekends, the park is transformed into a concert arena. Watch local talents perform their own brand of songs and be mesmerized with the idea that such talents remain undiscovered by showbizlandia. Your tour is not complete if you will not walk around the park, watch people, breathe fresh air, and stare at the vast surroundings. Appreciate the idea that an urban jungle can also be a home to nature.